Xavier Thibert-Plante (Ph.D. Mathematical Biology, McGill University, 2010) examines the impact of climate change on biodiversity, specifically the evolution of biodiversity and the process of biodiversification in a changing environment. As a NIMBioS postdoctoral fellow, Xavier Thibert-Plante (Ph.D., Biology, McGill University, 2010) studied how new species are formed. More precisely he studied the impact of ecological forces on evolutionary phenomena. One important aspect of formation of new species is the ability of the individuals to discriminate between conspecic and other species during reproduction. Therefore, he studied how species evolve the ability to discriminate among closely related species and which traits are more likely to be used as indicator (Thibert-Plante & Gavrilets, submitted). Thibert-Plante used the numerous computer clusters available to NIMBioS fellows to run his large scale numerical simulations. He also studied different aspects of ecological speciation, including the effect of facilitator (Liancourt et al. 2012), the effect of phenotypic plasticity (Thibert-Plante & Hendry 2011a), and the relative contribution of resource diversity, intraspecic competition and mate choice during sympatric speciation (Thibert-Plante & Hendry 2011b). 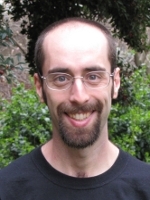 Upon completing his fellowship at NIMBioS, Dr. Thibert-Plante accepted a postdoctoral position in the Department of Ecology and Genetics at Uppsala University, Sweden. In September 2013, Dr. Thibert-Plante joined the faculty in the Integrated Science Lab in the Department of Ecology and Environmental Science at Umeå University in Sweden. Thibert-Plante X, Gavrilets S. 2013. Evolution of mate choice and the so called magic traits in ecological speciation. Ecology Letters, published online 19 June 2013. [Online]. Thibert-Plante X, Gavrilets, S. 2012. Evolution of mate choice, the trick behind the magic trait. Submitted to PLOS Computational Biology. Thibert-Plante X, Hendry AP. 2011. Factors influencing progress toward sympatric speciation. Journal of Evolutionary Biology. [Online edition] 24 June 2011. Thibert-Plante X, Berner D. 6-10 July 2012. The evolution of habitat preference in ecological speciation. Evolution 2012, Ottawa, Ontario, Canada. Thibert-Plante X, Gavrilets S. 17-21 June 2011. Evolution of mate choice, the trick behind the magic trait. Evolution 2011, Norman, Oklahoma. Thibert-Plante X, Hendry AP. April 16, 2010. Under what conditions can natural selection cause divergence at neutral loci? Ecology and Evolutionary Biology Seminar, Knoxville, Tennessee. Thibert-Plante X, Hendry AP. June 25-29, 2010. The consequences of phenotypic plasticity on ecological speciation. Evolution 2010, Portland, Oregon. Thibert-Plante X, Hendry AP. August 29-September 4, 2010. When can ecological speciation be detected with neutral loci? (Third Poster Prize), Methods of Empirical Speciation Research, Kastanienbaum, Switzerland. Thibert-Plante X. Local adaptation and gene ow shaping biodiversity; numerical simulation studies, Mathematics department, California State University, San Marcos, San Marcos, California, November 15, 2011. The Joint Synthesis Center Postdoctoral Symposium, National Evolutionary Synthesis Center, Durham, NC, April 17-20, 2011. AIC model selection and multi-model inference workshop, University of Tennessee, Knoxville, October 9-10, 2010. Methods of Empirical Speciation Research, European Science Foundation, Kastanienbaum, Switzerland, August 29th-September 4th 2010. Graph Theory and Biological Networks, National Institute for Mathematical and Biological Synthesis, Knoxville, Tennessee, August 16-18, 2010. Coordinator of the NIMBioS Postdoctoral Fellows Invited Distinguished Visitor program. Arranged visits by Abdul-Aziz Yakubu, Mark Kirkpatrick, Peter Hammerstein, Mark McPeek, Fred Adler, Russell Lande, Andrew Pomiankowski and Joshua Plotkin. Reviewer for BMC Evolutionary Biology, Evolution, Evolutionary Ecology, Genetics, Journal of Biological Systems, Molecular Ecology, Plant Systematics and Evolution. Cristian Correa visited Thibert-Plante to collaborate on The pace of modern life: rates of phenotypic change in natural populations. Co-mentor: Three Research Experience Undergraduate (REU) students (Rojin Chitrakar, Shreejaya Shrestha and Christa Wisniewski) for 2011 summer project on antifungal effects of essential oils on a biocontrol fungus. Rojin Chitrakar and Shreejaya Shrestha presented "The Effect of Borneol on the Germination and Growth of the fungus Beauveria bassiana" at the Third Annual Undergraduate Research Conference at the Interface of Biology and Mathematics, October 2011 at the University of Tennessee Conference Center. Training activities. During each semester at NIMBioS, Thibert-Plante attended the Math Ecology Seminar, the Gavrilets lab meeting and the Ecology and Evolutionary Biology Friday seminar. The mechanics of speciation. Terra Daily. The mechanics of speciation. Machines like us. Factors contributing to mechanics of speciation. TS-Si. The mechanics of speciation. e! Science News. The mechanics of speciation: Model examines factors that contribute to the emergence of new species. ScienceDaily. The mechanics of speciation. Weekly Exclusive National Science Foundation's 360 News Service. The mechanics of speciation: Model examines factors that contribute to the emergence of new species. EurekAlert.